This holiday has basically become known as ‘Doggo’s Road Trip’. He loves all of our holidays (except the one’s he ends up in kennels for the duration of) but he does seem particularly fond of our winter jaunts to Scotland. Therefore, as we’re not sure how many more trips the old dog has in him, this one’s for him. After a 9.30am departure from home (which is early for us) it is an eight hour trip, seven if you discount stops, up to our cottage at Ballachluish which is just past Glencoe. 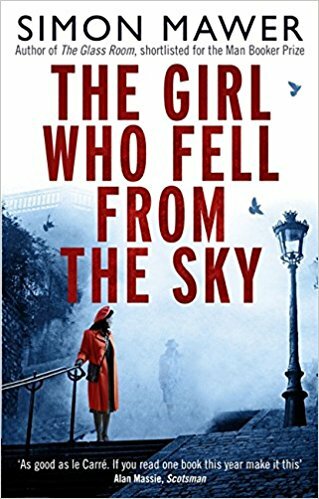 The chosen audiobook is ‘The Girl Who Fell from the Sky’ by Simon Mawer about a British girl flown out to France to work with the resistance during World War II. Totally my sort of thing. It is raining when we arrive, so typical Scottish weather. There is also very little snow on the peaks and the next fall isn’t forecast until Wednesday, so skiing isn’t looking very likely. Doggo seems less than impressed with things so far and squats in the middle of the lounge. I suppose it’s his holiday so he can do what he wants to but I think his day improves. The highlight of his evening being a trip to the local Co-Op and the chippy. We crack open a bottle of red to go with our fish n chips and spend a night in watching Citizen Four. We have brought a few videos with us, as we can’t do any films whilst in Scotland as the nearest cinema is in Oban. Although they do have occasional screenings at the Nevis Centre and a mobile cinema comes round sometimes. Somehow, I doubt we’ll watch many. Sunday we get up late, as ever, and head to the Co-Op to pick up the necessary to do a Full Scottish, which includes haggis and Lorne sausage but the Sunday paper come without all the supplements. We must be out in the wilds or something. Later we walk round the lake at Lochran for old times sake and then do it again as MD’s ball is pinched by a four legged young filly who takes a bit of a shine to MD and he to her. After that, it’s nearly 5pm, so pub time. We have a couple of dark ones, Loch Lomond Stramash and Strathaven Ebony, in a very busy Clachaig Inn before returning to Ballachluish for an excellent meal in the Laroch Bar. Sadly, they only have Deuchars IPA on the bar so we have a bottle of Rioja instead. Camra’s WhatPub site has the place down as closed, so when we get back I email to update them. The cottage comes without Wi-Fi, so I have brought my own mobile internet, which seems to work well. They get straight back to me and swiftly update the entry before I’ve even finished watching SS-GB on TV. Monday and Tuesday follow the same pattern, get up late and do our own Full Scottish, then a walk around the local trails. Monday evening we do the pub quiz in the Clachaig where we come an impressive 5th of about 20 teams. If only I could have remembered all four corners of the Monopoly board then we’d have been in a tie for third. First and second come from a group of 20 sat together. Hmmm, teamwork or cheating, depending on your point of view. We celebrate with Ben Nevis/Loch Lomond/Clachaig whiskies. The origins of the Clachaig’s own malt is apparently a closely guarded secret, so probably from the Co-op then. On Tuesday evening, we visit the Glencoe Gathering which is the bar next to and part of the Glencoe Inn. The Inn is open midweek this time, it wasn’t the last time we were up here and the Gathering was boarded up. The Gathering is now open and really nice. It also sells River Leven ales, two of them IPA and Blonde, which are brewed at the old Atlas Brewery in Kinlochleven as we later find out. Atlas first merged with the Orkney Brewery before both were taken over by Sinclair Breweries and the Atlas Brewery was closed. We have a few problems at the Gathering though. First, the barman serves me a very short measure, which he says is fine but then after continued whinging by me he eventually grudgingly tops it up but then charges us over a tenner for one pint plus a 175ml of wine. Then he tells us all the food is off unless its battered e.g. comes from their onsite Fish and Chip shop, although we may get it on a plate I suppose. We decline, sup up (it was a nice pint) and then head back for another night at the excellent Laroch. We round off our meals with Macallan and Auchentoshan Glasgow whiskies. Wednesday we head out for breakfast and find a nice café at Onich, then walk a 6k trail above the waterfalls at Inchree, which sadly comes back along the busy A82, but it’s still a nice walk and in sunshine for the first time this week. In the evening, we basically walk across the road for tea at the Isles Of Glencoe hotel. Thursday is supposedly ‘Doris Day’ but Storm Doris doesn’t really materialise. Not up here anyhow. There is snow up on the hills but it’s still raining in the village. We head up to Glen Nevis and walk the trails from the Braveheart car park then go for hot chocolate in Cobbs Café underneath Nevisport in Fort William. In the evening, we drink and eat in the Clachaig where another dark beer has appeared, Orkney Dragonhead, along with the excellent 5.1% Cairngorm Wild Cat that we enjoyed in the summer. There is more snow up high overnight, which means that the ski areas do open on Friday but there’s not really enough to bother getting the skis out for. We go up to Glencoe ski centre anyway and support the café before taking another walk around Lochran and a couple of late afternoon Wild Cat’s back in the Clachaig. Then it’s back over to the Isles of Glencoe for tea where I hit their bottled beer collection. Then Saturday dawns, wet and blustery of course, as we head home stopping off just before the Erskine Bridge for breakfast, again making the 11:30am cut off by the skin of our teeth. At What Age Does That Happen?